Hedysarum hamatum L., Stylosanthes eriocarpa Blake, Stylosanthes procumbens Sw. (ILDIS, 2009; USDA, 2012). The Caribbean stylo (Stylosanthes hamata (L.)Taub.) is a semi-erect, annual or short-lived perennial tropical legume, up to 75 cm high. Its stems are slender, multi-branched, non-determinate and pubescent on one side but without bristles, unlike the Townsville stylo, Stylosanthes humilis, which has many bristles. The leaves are trifoliate with shiny, lanceolate leaflets, 19-37 mm long and 3-6 mm broad. The inflorescence is a compact oblong spike bearing 8 to 14 small, yellow, hairy and papillonaceous flowers. The single-seeded pods are erect and segmented. The upper segment is glabrous and hooked, 6-7 mm long including the length of the hook (Cameron, 2010; Cook et al., 2005). The seeds are kidney-shaped, dark brown, mottled and 2-2.5 mm long. There is a wide range of Caribbean stylo genotypes, differing in their ploidy. Diploid types are adapted to a wider range of latitudes, altitudes and rainfall ranges than tetraploid types (FAO, 2012; Cameron, 2010; Edye et al., 1992). In Australia, two tetraploid cultivars (Verano in 1973 and Amiga in 1988) have been released as pasture legumes. Amiga produces more perennial plants and more seeds than Verano, in drier and cooler environments (Cameron, 2010; Edye, 1997). Diploids are generally not sown for pastures (Edye et al., 1992). Stylosanthes hamata is widely used to improve the flora of natural pastures and leys and for the creation of forage banks (Coulibaly et al., 1996). The Caribbean stylo is relished by all classes of livestock (Cook et al., 2005). 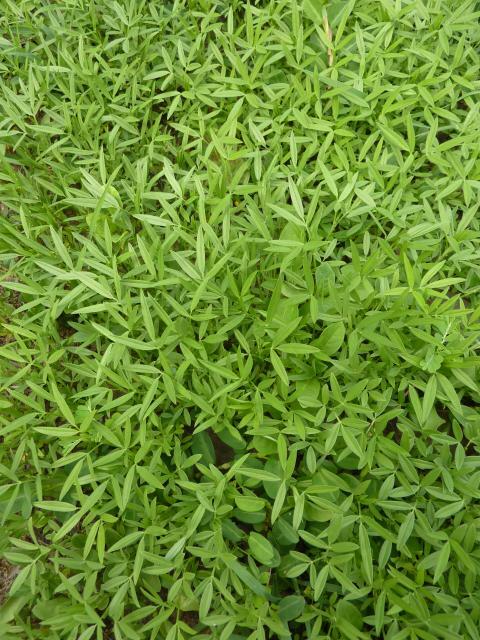 It is mainly used as permanent pasture but is also cut to be fed fresh in cut-and-carry systems. It may be used for hay provided it is cut before the plant sheds its leaves in the dry season. It can be easily oversown in pastures and is a valuable ley-legume. It can be used as mulch once killed by herbicides (McCown, 1987). Sylosanthes hamata originated from the Caribbean Islands, Southern Florida, Central America and South America, where it is mainly found in Colombia, Venezuela and Brazil (Edye et al., 1992). It is now also found in India, West Africa and Northern Australia. There are only minimal morphological differences between tetraploid and diploid genotypes but their growing preferences are different. Tetraploid types are found in a narrow range of latitudes (9°N to 11.5°N) and generally below an altitude of 500 m. They are best adapted to drier areas with pronounced dry season (Cook et al., 2005). Tetraploid cultivars (Verano and Amiga) do better in areas with 700 to 900 mm rainfall but they can survive long dry periods (Cameron, 2010). Stylosanthes hamata is the most drought-resistant stylo species and has been found in Venezuela in areas with less than 300 mm rainfall (Coulibaly et al., 1996). Though Caribbean stylo landraces may have some waterlogging and flooding tolerance, many cultivars do not stand flooded conditions (Cameron, 2010). Caribbean stylos can grow on a wide range of soils, except heavy clays, with a pH ranging from 5.4 to 8 (Cook et al., 2005). A characteristic of the Caribbean stylo is its ability to forage P from the soil. It also has some tolerance to salt (Cameron, 2010; Edye et al., 1992). Stylosanthes hamata is resistant to anthracnose, unlike some other Stylosanthes species (Coulibaly et al., 1996). Tetraploid Caribbean stylos (including Australian cultivars) are generally used as a short-lived perennial in summer pasture. They can be sown with short companion grasses such as Urochloa mosambicensis and Bothriochloa pertusa, or with legumes such as Aeschynomene americana, Chamaecrista rotundifolia, Stylosanthes guianensis and Stylosanthes scabra. Establishment is facilitated by prior removal of competing plants followed by seed bed preparation, but the Caribbean stylo can also be oversown or strip-planted in existing pastures (FAO, 2012). When sown in mixture with grasses, early grazing of the stand should be allowed in order to limit the development of companion species, thereby promoting its growth, since it is not as palatable as grass in its early stages (Edye et al., 1992). Fire is a potentially useful tool in renovating Stylosantes hamata swards with their large soil seed bank. 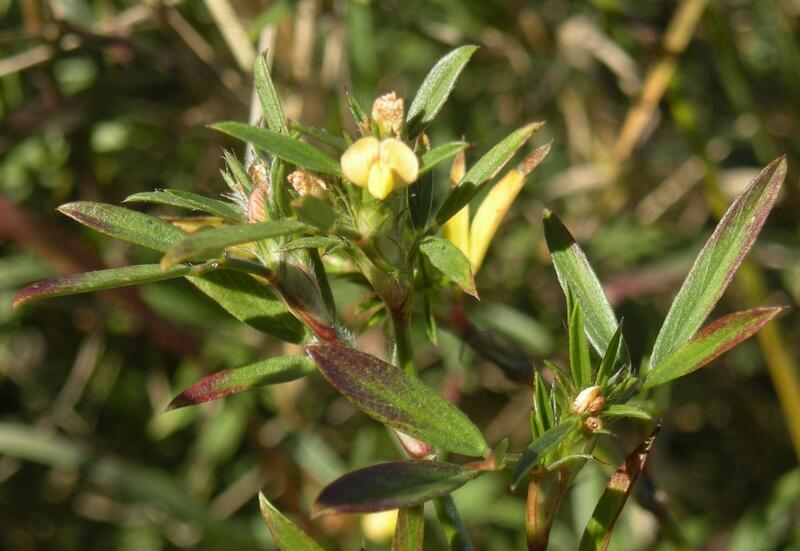 However, fire can be extremely detrimental to swards of Stylosantes scabra and Styosanthes viscosa, where plants are susceptible to burning and there is little seed available in the soil bank (Mott et al., 1989). Once established, the Caribbean stylo can produce between 10 and 17 t DM/ha in pure stands under favourable conditions. When sown in mixed stands, it can yield 1-7 t DM/ha (Cook et al., 2005; Edye et al., 1992). In India, under rainfed conditions, Stylosanthes hamata cut at 80 days after sowing at 50% flowering yielded 8.6 t DM/ha (Nandanwar et al., 1991). Grazing should be avoided within the first year of establishment in order to promote seed setting. Heavy, continuous or rotational grazing is beneficial to its growth at the expense of grass growth. When rotationally grazed or cut, four-week rest periods should be respected (Cook et al., 2005). Grazing is necessary for perennation, otherwise Caribbean stylo is more likely to behave as an annual (Cameron, 2010; Cook et al., 2005; Edye et al., 1992). Even after leaf shedding under dry conditions, the Caribbean stylo remains well-grazed by livestock, which selects green stems, fallen leaves and seed heads. In India, where there is a longstanding practice of growing fodder crops in fruit orchards, Stylosanthes hamata has been tested in various horti-pastoral systems. When Caribbean stylo was sown after the moonson in guava, lemon, mango or kinnow (Citrus nobilis "King" x Citrus deliciosa "Willow Leaf") orchards, yields were improved with added fertilizer, and were best under lemon and kinnow (Gill, 1988). Stylosanthes hamata grown under Indian gooseberry trees (Phyllanthus emblica) yielded 2.9 t DM/ha that provided supplementary grazing to lambs (Murugan et al., 2003). Caribbean stylo grown in natural pasture under annona trees (Annona squamosa) was found significantly superior in terms of total dry forage and protein yield to Stylosanthes scabra (Ram et al., 2010). In India, Stylosanthes hamata is often sown under Eucalyptus and Dalbergia trees (McCown, 1987). Because leafy material still grows after flowering, the Caribbean stylo is a valuable deferred feed (Cameron, 2010; Cook et al., 2005). It provides good quality hay and silage provided it is cut before it sheds its leaves (Cameron, 2010). The Caribbean stylo is a freely nodulating N-fixing legume. It provides N to the soil, available to both associated and subsequent crops/grasses. Stylosanthes hamata is considered a good green manure or ley legume. In the uplands of Thailand, it has been intercropped with cassava to preserve the top-soil and improve fertility (Gibson, 1987). It has been used as mulch after herbicide treatment in order to decrease soil temperature in infertile, hot and dry soils (McCown, 1987). In India, it has been recommended to improve range and degraded lands and is used as a component in watershed and soil conservation programs (Nagaich et al., 2009; Cook et al., 2005). Stylosanthes hamata contains about 16% DM as protein (10-24% DM) and is, therefore, less rich in protein than other tropical legumes such as Leucaena or Gliricidia. Lower protein content has been observed in West Africa, 6-10% DM in sub-humid Nigeria, or 11% DM in the Sudano-Sahelian region (Coulibaly et al., 1996). Fibre content is variable and rather high, with an average of 33% DM as crude fibre (24-49% DM). Lignin content also tends to be high. Nutrient composition is likely to vary with the stage of maturity and the leaf:stem ratio. For instance, Caribbean stylo hay harvested at 90 days after sowing had a higher protein and nutrient digestibility in goats than hay harvested at 150 days (Singh et al., 2001). In spite of its moderate protein value, Stylosanthes hamata, like other legumes, is a valuable fodder for providing protein to livestock fed grasses or low-protein feeds, and is thus frequently associated with grasses. In Sub-Saharan Africa, Stylosanthes hamata can improve the quality and the quantity of forage production, particularly in the second half of the rainy season, when there is a sudden drop in the nutritive value of grasses (Coulibaly et al., 1996). No toxicity has been recorded so far (FAO, 2012; Cameron, 2010; Cook et al., 2005). There are few data reporting the digestibility of Stylosanthes hamata. Using an equation obtained on other Stylosanthes species (OMD % = 67.2 – 0.214 NDF % DM + 0.335 CP % DM; N=19, R²=0.40, RSD=3.1; Sauvant, 2012), the average OM digestibility of Stylosanthes hamata forage can be estimated at 62% (55-68%), corresponding to an ME of 8.8 MJ/kg DM (7.5-9.9 MJ/kg DM). In fresh Caribbean stylo harvested at 80 days (50% flowering), DM digestibility was 65%, and crude fiber 34% DM (Nandanwar et al., 1991). One study on Stylosanthes hamata mature forage (called “straw” in the report and containing about 7% DM as protein) indicated a DM digestibility of 51% (Misra et al., 1997). Digestibility of NDF is probably the limiting factor: an in sacco digestibility (48 h) of NDF was found to be only of 41% (for a sample containing 55% NDF DM; Kennedy et al., 1999). Besides, indigestible NDF was associated with a limited buffering capacity in the rumen (Bandla Srinivas et al., 2010). As noted in Nutritional attributes above, the digestibility of Carribean stylo hay decreased between 90 and 150 days after sowing (Singh et al., 2001). Stylosanthes hamata is able to improve tropical grazing systems (Cameron, 2010). Various studies in India and West Africa have shown that oversowing grasses with Caribbean stylo removed the N limitation, resulting in a dramatic increase in stocking rates and live-weight gain per ha (Winter, 1989). In India, feeding a 3:1 mixture of Cenchrus ciliaris and Stylosanthes hamata as hay or fresh grass, to adult male goats, was better than feeding Cenchrus as the sole fodder (Ravi et al., 2000). Supplementation of a natural grass pasture (Cenchrus ciliaris) with legume (Stylosanthes hamata) and tree leaves (Albizia lebbeck) improved the nutrient digestibility and utilization in sheep (Pailan et al., 2003). In Côte d'Ivoire, a well-managed association of Guinea grass (Megathyrsus maximus) and Stylosanthes hamata was found superior to natural grassland. The sward was more resistant to close grazing, had an increased nutritive value, and could support higher stocking rates (César et al., 1999). In Cameroon, Stylosanthes hamata and Calopogonium mucunoides were planted and divided into cutting, grazing and control subplots: legume seed production was found feasible and manageable under an integrated dairy (zebu) production system (Asongwed-Awa et al., 2002). In Nigeria, West African Dwarf sheep fed forage from Andropogon tectorum intercropped with Stylosanthes hamata at different inter-row spacings (0, 2.5, 5.0 and 7.5 m) had the highest final weight gain and average daily gain at a spacing of 2.5 m (Aderinola et al., 2010). Studies were also carried out in Mali to introduce Stylosanthes hamata and improve sheep and cattle production (Coulibaly et al., 1996). In Thailand, the intercropping of Caribbean stylo and cassava was able to triple the net income compared with cassava alone (Gibson, 1987). As noted in Forage management, Stylosanthes hamata can be grown under orchard trees. In India, mixtures of Stylosanthes hamata and Cenchrus ciliaris in mango and sweet orange orchards resulted in higher live weights in lambs compared to those grazing solely on natural pasture (Ramana et al., 2011). Supplementation with Carribbean stylo can be useful in the case of nutrient-poor diets. In India, Caribbean stylo hay and Leucaena leucocephala leaf meal improved intake, digestibility and utilization of nutrients in sheep fed Cenchrus ciliaris hay (Pailan et al., 2005). The nutrient digestibility of rice straw by bulls was increased with supplementation with Stylosanthes hamata (Reddy, 1998). In Northern Australia, the introduction of legumes, including Stylosanthes hamata, resulted in a significant increase in beef cattle production, especially when P was added to the soil (Coulibaly et al., 1996). Cattle grazing Stylosanthes hamata showed less weight loss in spring than cattle grazing grass, though there was a rapid weight loss in early summer (McKeague et al., 1979). In steers grazing native pastures or pastures oversown with Caribbean stylo, annual live-weight gain was related to the duration of green forage availability, the amount of Stylosanthes hamata in the pasture, and herbage utilization rate (McCaskill et al., 1993). In India, under rainfed conditions, Stylosanthes hamata containing 13.4% DM as protein, allowed a live-weight gain of 180 g/d in heifers (Nandanwar et al., 1991). In the seasonally dry tropics, where stylo leaf can contain less than 7% DM as protein, the dry winter season grazing may be unable to sustain steer live weights even on stylo dominant pastures. Under these conditions Caribbean stylo pastures may require protein supplementation to prevent weight loss in the dry season (Hall et al., 2004). In dairy buffaloes in India, 25% of concentrate (DM basis) was replaced by Caribbean stylo meal without affecting milk yield and composition in lactating buffaloes (Pailan et al., 2010). In Cameroon, with dairy cows grazing legumes intercropped with maize, cows fed Stylosanthes hamata gave 35% more milk compared to cows grazing Calopogonium mucunoides or Macroptilium lathyroides (Asongwed-Awa et al., 2002). In Nigeria, the association of Stylosanthes hamata with Guinea grass was a better option for improving the feed quality of forage diets for goats than direct application of inorganic fertilizer at 200 kg/ha N to the pure grass (Bamikole et al., 2001). Also in Nigerian trials with grazing goats, Stylosanthes hamata established rapidly, but it was necessary to maintain good pasture conditions from the second grazing or cropping season (Iji et al., 1995). In Mali, studies in the early 1990s showed that Stylosanthes hamata could increase sheep production by 10 kg/ha (unfertilized pastures) and by 29 kg/ha with added P (Coulibaly et al., 1996). In India, feed blocks based on Stylosanthes hamata were sufficient for maintenance requirement of sheep and goats (Das et al., 2007). Sheep and goats could be maintained with acceptable growth rates on silvopastoral systems. Stylosanthes was the preferred plant species in mixed species pasture (Rai et al., 1998). Lambs grazing on a silvopastoral system and supplemented with either concentrate or Stylosanthes hamata had higher average daily gains and better feed efficiency than those that were not supplemented (Rao et al., 2007). Caribbean stylo can be fed fresh or as leaf meal to pigs. In China, freshly cut Stylosanthes (including Stylosanthes hamata) mixed with wheat or rice bran and other feeds has long been used by farmers to raise pigs, thus reducing the cost by replacing part of the grain component. In the mid-1990s, smallholders, especially in Hainan Province, began to harvest Stylosanthes, sun-dry it and grind it into a powder, using small grinders, to provide a feed for pigs and poultry. Blends of different stylo leaf meals (45% Stylosanthes guianensis, 45% Stylosanthes hamata and 10% Stylosanthes scabra) were included at 20-30% in pig diets. Pigs fed a diet containing 10-15% Stylosanthes meal, or green Stylosanthes cut into 2-4 cm pieces, and cooked with other feed wastes performed satisfactorily (Bai Changjun et al., 2004). Information on the use of Stylosanthes hamata in poultry is limited. Blends of different stylo leaf meals (45% Stylosanthes guianensis, 45% Stylosanthes hamata and 10% Stylosanthes scabra) have been included at 4% to 6% in the diets of chicks up to four weeks old and at 8% to 12% later, with no major effect on average daily gain or final weight. Stylo leaf meal should preferably be included at 2-5% in broilers, 8-12% in ducks and 15-20% in geese (Bai Changjun et al., 2004). In Australia, Stylosanthes hamata cv Verano was shown to be very palatable to rabbits, as it attracted more rabbit grazing than siratro (Macroptilium atropurpureum): half of the Verano grown was eaten by rabbits (Hall, 1988). In Nigeria in several trials, Caribbean stylo was considered a suitable forage for rabbit feeding when included in balanced diets. When used alone, Verano hay was not able to support rabbit growth. However, when replacing 50% of the concentrate, it could sustain similar average growth rates as the control diet (100% concentrate) (Bamikole et al., 1999). Diets with up to 80% of Caribbean stylo hay sustained rabbit growth compared with diets containing lower hay:concentrate ratios, with no detrimental effect on slaughter rate (Iyeghe-Erakpotobor, 2006). In doe diets, a 60:40 concentrate:Verano stylo blend resulted in better reproductive performance (mainly due to better fertility rates) than 40:60 and 80:20 blends (Iyeghe-Erakpotobor et al., 2008). Beyond the usual value of legume forages as source of protein and fibre for rabbits, the Caribbean stylo has a high level of calcium and a relatively high level of phosphorus for a legume forage (Oyawoye et al., 1990).